Looking for some ‘purrrrr’ therapy? If the idea of sharing your table with cuddly kitties sounds exciting, a cat cafe is the place for you. With so many cats around, you are spoiled for choice as to which darling to cuddle while sipping your coffee. From cat mugs to beautiful cat decor, these cafes are simply a paradise for staunch animal lovers. Not just minting money, these cafes are also serving a social cause by rescuing Indian cats and rehabilitating them. Located in Mumbai, Cat Cafe Studio is India’s first cat cafe. It is an amazing place to lounge with your feline friends while sipping your freshly brewed coffee. There are more than 30 cats in this cafe with whom you can play and interact. 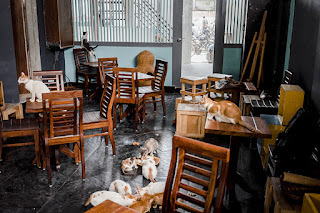 Till date, about 300 cats have been adopted from the café. If you are looking for lowest airfares, online cheap flight booking via ixigo is the best option for you. Compare the prices of various airlines through ixigo.com and choose the best deals. The best way to de-stress yourself from the heavy load of traffic is spending some time with your furry friends. Located in Indiranagar, The Cat Studio is an abode to some of the cutest kitties ever. 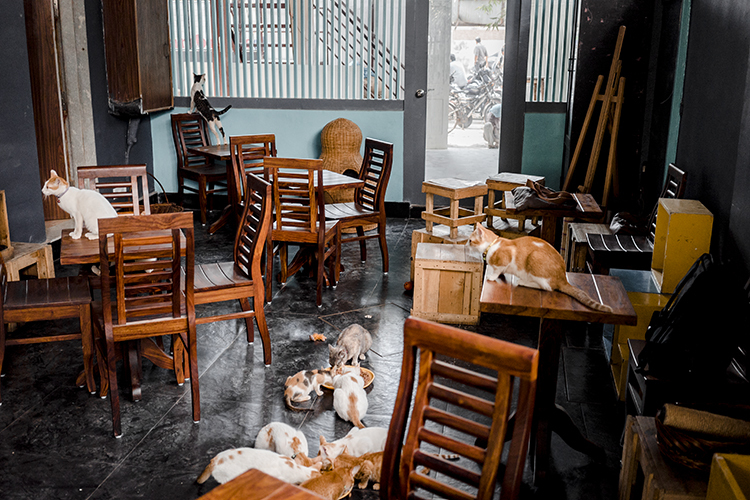 The ambiance of this cafe is very soothing and serves as a beautiful home for many rescued kittens. Even if you are not a cat fan, you must spend some time in this cafe as you never know purr therapy might work for you. If you are a cat lover, a visit to the Brooklyn Cat Cafe is sure to give you immense pleasure. Located in the Brooklyn Heights neighbourhood, this cafe provides a cosy space where you can spend leisure time with your feline friends. Most of the cats and kittens in this cafe are up for adoption and in search for loving homes. Also, the cafe has a wide menu with vegetarian and non-vegetarian delicacies. Home to the famous hermitage cats, Cats Republic is the first cat cafe in Russia. These furry comrades are used to save the Petersburg art collection from rats, and once they retire, they end up at the Cats Republic. They are given immense love and proper care at this cafe. Also, there is a beautiful library and a gift shop in this cafe. Due to the strict no-pets policy in many of the Japanese apartments, it is no wonder that this country has the maximum number of cat cafes in the world. Neko no Jikan, opened in the year 2004, is the Japan’s first cat cafe. You can spend 1 hour with the cats at ¥1000 and with a drink at ¥1250.